We made it very easy for you to put on your Mustang Blowfish Racing Shifter Support Bracket with our install video. This Blowfish Racing bracket is designed with several key features to help the rather sloppy performance from a factory spec MT-82 transmission. The factory shifter is actually connected to a body mount, which causes the shifter to twist under load or spirited driving. This Blowfish bracket removes the body mount and attaches as a support link from the back of the shifter to the transmission. This keeps the shifter and transmission in line with one another at all times for perfect, precise shifts. Locate the shifter bracket under the vehicle, just behind the shifter assembly and above the driveshaft. Using the 10mm DEEP Socket, 12" Extension and 1/4" Ratchet, Remove the (2) Nuts from the Body Studs. Place the upper bracket over the driveshaft. Locate the (3) Bolts that attach the Transmission Mount Isolator to the Transmission. Using the 15mm Socket and Ratchet, loosen, BUT DO NOT REMOVE, the bolts to allow a bit more than a 1/4" gap between the Isolator Body and the backside of the bolt head. Place the lower Bracket over the center bolt head until it contacts the Isolator Body. Then, simply slide it downward to engage the Bracket's slots. Once the Bracket is completely seated, tighten the (3) bolts back up and torque to 35ft/lbs. Slide the Pins into the backside of the Upper Bracket.Using the supplied (2) M6 Hex Screws, attach the Isolation Clamp Assembly to the Shifter Box Snout. Position the Clamp as far rearward as possible. Torque bolts to 6ft/lbs. . Position the Upper Bracket so the Slots line up with the rectangular holes in the Lower Bracket. Slide the lower clamp assembly as far back as it will go and torque to 25ft/lbs. Push up on the lower bracket and then torque the nuts to 45ft/lbs. Blowfish Racing designed their shifter support bracket with several key features to help the already-decent performance from the factory spec MT-82 transmission. The factory shifter is actually connected to a body mount, which causes the shifter to twist under load or spirited driving. This Blowfish bracket removes the body mount and attaches as a support link from the back of the shifter to the transmission. This keeps the shifter and transmission in line with one another at all times for perfect, precise shifts. The Blowfish Racing bracket will greatly improve shifting accuracy, even with a factory shifter. Each bracket kit will come powder coated in the ever-so-popular Ford Blue, as well as all of the needed hardware and extremely detailed installation instructions are in the box. As an added bonus, the Blowfish Racing engineers integrated a NHRA legal driveshaft safety loop which will further save you some cash since you won’t have to add one later on down the road. This support bracket is designed to work with all 2015-2016 V6, EcoBoost, and 5.0L Mustangs with the MT82 transmission. What’s going on everyone? Landan here with Late Model Restoration. Today I’m going to be giving you my rundown on Blowfish Racing’s shifter support bracket fitting your MT-82 equipped 2015-2016 Mustang. Ford did a great job on improving the MT82 transmission when the 2015 Mustang rolled out versus the previous MT82 found in the 2011-2014 cars. It features a re-designed, aluminum shifter linkage, as well as internal changes to reduce synchronizer drag and improve precision and gate-position feedback. 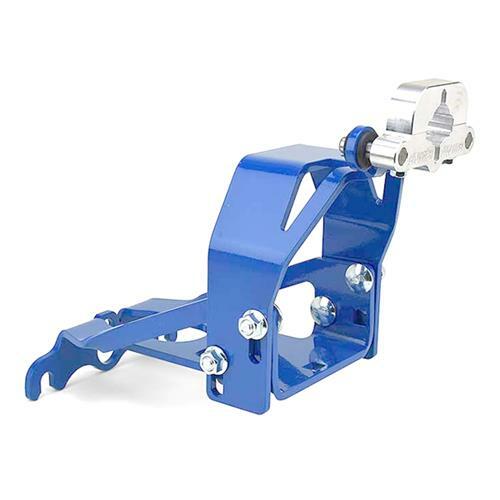 However, there is usually always room for improvement and this shifter support bracket from Blowfish Racing will do just that. This support bracket is designed to work with all 2015-2016 V6, EcoBoost, and 5.0L Mustangs with the MT82 transmission. So follow along fellas, as I walk you through the detailed steps on installing Blowfish Racing’s shifter support bracket into this 2015 White 5.0L. To begin installation, place the car on a lift or jack stands. You do not have to remove the exhaust or driveshaft for this install. Locate the rear shifter support bracket and remove the factory bracket from the car with a 10mm deep socket and 12 inch extension. Position the upper bracket over the driveshaft. Locate the transmission to cross member bolts and loosen, but do not remove, the bolts to allow a little more than a quarter inch gap between the underside of the bolt head and cross member. Position the lower bracket over the bolts using the center “keyhole” as a reference point. Torque the bolts to 45 lb/ft. Slide the upper bracket even with the lower bracket. If needed, apply a small amount of lubricant to the lower clamp half pins to help with installation into the upper bracket. Be sure and use a lubricant that does not contain solvents. Slide the lower clamp into the upper bracket. Position the upper clamp over the shifter base. Slide the clamp assembly as far back as it will go and then torque the supplied hardware to 25 lb/ft. Line up the slots on the upper bracket with the lower bracket’s rectangular holes. If the slots are offset, which is normal for V6 and EcoBoost models, use the supplied extension bracket to add an extra set of rectangular holes to the back of the lower bracket. Loosely attach the upper and lower brackets together using the supplied M10 bolts. Place the bolt head on the inside of the lower bracket with the threads protruding through the upper bracket. Loosely tighten the nuts. Push up on the upper bracket and then torque the nuts to 45 lb/ft. Double check your work and you’re all done. As far as installation goes guys, allow yourself roughly an hour to an hour and a half from start to finish. This is something you can do by yourself in your own garage. The only recommendation I have for you is, get the car as high as you can if you’re working off of jack stands. If you guys want to continue watching the best install videos for your S550 Mustang, then hit the subscribe button and receive all of our latest video updates on our YouTube channel. If aren’t watching this from the product page, head back over to the site and pick up a Blowfish Racing shifter support bracket for your 2015-2016 MT82 equipped Mustang at LMR.com!